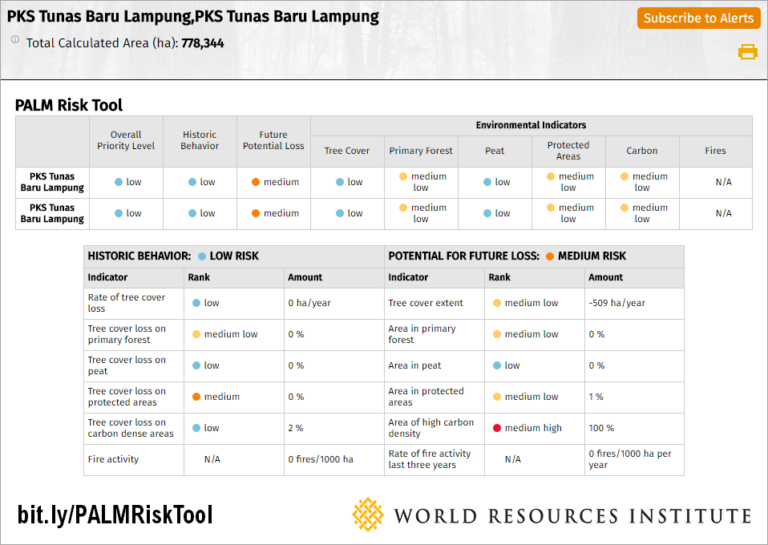 Global Forest Watch – Commodities is proud to announce the integration of the PALM Risk Tool (Prioritizing Areas, Landscapes and Mills), a groundbreaking tool aiming to eliminate deforestation surrounding palm oil production across Indonesia, Malaysia and elsewhere. With a global data set of nearly 800 palm oil mills, corporations have for the first time the resources needed to commit to deforestation-free palm oil sourcing. To make this tool successful in real-time, the application utilizes satellite-based data alongside regularly updated mill data. Users can select one or multiple mill sites, and analyze data surrounding this location for fire activity, tree cover loss, and high-carbon peatlands. Based on this analysis, rankings are calculated to create a more focused and efficient approach to sustainable palm oil production.